Luxury awaits in this grand mountain estate which has a front row seat to sunsets each and every night overlooking Sugar Mountain and beyond. Elegance is found within with hardwood floors running throughout the main living area including the spacious great room, gourmet kitchen, dining, den, and master suite. The sizable deck has both covered and open options for multi-season enjoyment. All three upstairs bedrooms are oversized and have their own bathroom. The lower level is ready to be finished with the buyer's touches for additional living space with its own deck, bonus room, and full bath. This refined home has left no detail or use of space overlooked. One will find a massive two story stone fireplace, unique use of texture and wood, custom built-ins, wet bar, custom lighting, walls of windows and doors, and an enormous amount of storage. On approximately 3.35 acres this beautifully landscaped property is a premium with beautiful views from every angle, gorgeous yard space, and rock outcroppings. 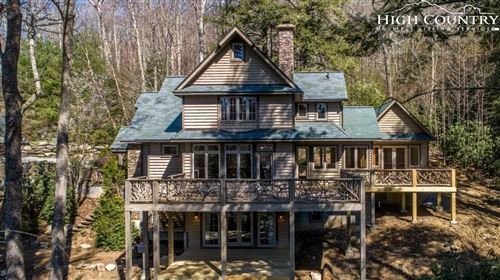 Tynecastle is a well-appointed gated community which is known for its central location and picturesque setting in the base area of Grandfather Mountain.